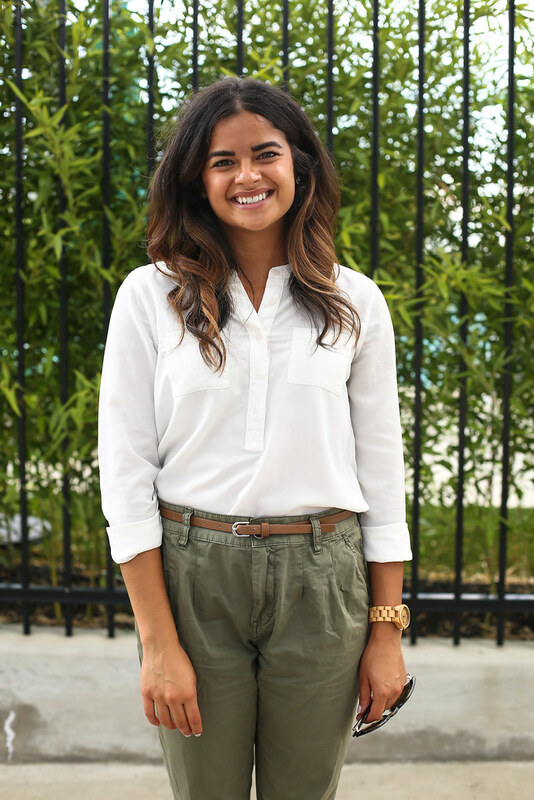 Style Safari | Priya the Blog | life & style in Nashville & beyond! Isn’t it funny how a piece in your closet can go from a favorite to basically an orphan until you remember it again? That’s how I feel about this blouse! When I bought it a few years ago, I loved how it went with everything, as a great alternative to a white tee or button-down. Well, that’s still totally true, I just forgot about it for a while. When I was running out the door for work the other morning (well…every morning) I needed a neutral to go with these pants, that I have a love/hate relationship with. I love having an option for pants that aren’t jeans (one of my wardrobe staples!) but every single time I wear them, I can’t stop thinking about how huge my pelvis looks. I’m historically such a flats girl, but lately I’ve been gravitating towards -you’ll never guess- clogs and wedges. I’m not insecure about being petite, though I do feel a little more put-together and confident with a few extra inches under me. And I'm still dreaming of that miracle growth-spurt and I’m convinced 5’6” is the perfect height. Point being- it was nice to give these flats a spin again! I would love to add a gorgeous pair of Madewell flats to my closet (like these! ), I think that would put me back on track with my affinity for flats. Looking back at these pictures, I'm totally getting safari vibes, ha! Anyway, this came together nicely and the pants are staying in my closet…for now. And this fab hair was leftover from helping an old friend from college, Molly, launch her hair styling airstream trailer the day before! Yeah, Hair & Yonder is as cool as it sounds and I loved being a part of the shoot. Can’t wait to share those images as soon as the website launches! Have a fabulous weekend, everybody! Looking forward to chillin' around town after last weekend and definitely catching some of the Summer Olympics!